This month the Bermondsey FROG didn’t do any monitoring visits, but instead joined in with the fieldwork, which conveniently for us was in Rotherhithe. With plenty of trainee FROGs to help, lots of recording was done on the timbers of the barge bed in front of Brandram’s Wharf, where erosion has been fierce. This was brought home by the whale bone, which used to look as if it was a vertebra, but now that you can see at least a foot more of it, is clearly a long bone. And then the rate of erosion was really demonstrated when, just as we were all leaving on Tuesday, we saw that one of the very large windlasses was trying to float away. 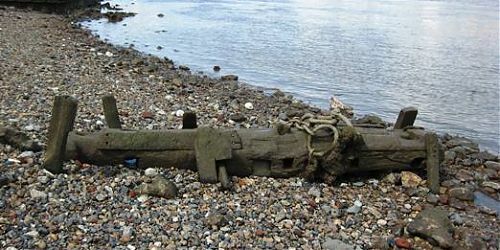 It seemed unbelievable that such a large, heavy and waterlogged piece of wood could be lifted by the tide. It hung around for a while, possibly with a chain caught on something, but has now been seen way downstream, somewhere on the Greenwich foreshore. 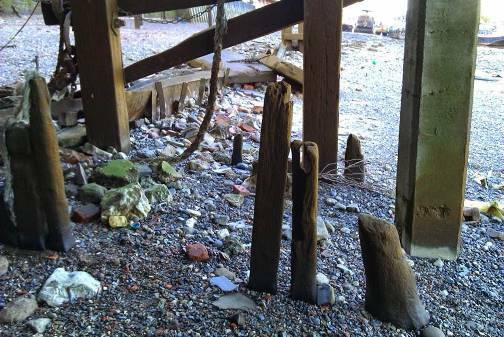 An interesting feature of the foreshore here in Rotherhithe is that there seem to have been boundaries marked out between properties, or at least between Brandrams and the rest! I don’t know whether this is usual, or what the point would have been. 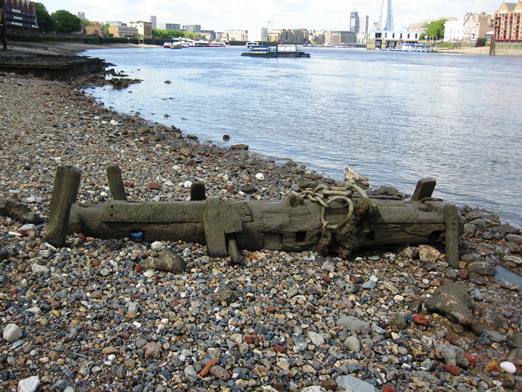 The foreshore today in London belongs to either the Crown Estate or the Port of London Authority. The Bermondsey FROG wanted to try out the CITiZAN app, and we picked the upstream boundary timbers to try it with. It seems very straightforward to use, but asks far more questions than we’d really want to answer down on the foreshore (especially in winter!). We didn’t make a proper full record, but at least we have given it a try. This is important to overcome our fear of technology! At the end of the week, we moved on to Bermondsey, as we’d asked Eliott if we could have some helpers, and a base line, to record the timbers at the end of Chambers Wharf, close to East Lane stairs. We think these timbers represent a causeway, or possibly two stages of one, related to an earlier position of the stairs. They don’t line up with the current stairs (which are locked anyway), and we don’t know how they relate to the 19th century brick walls, or to the fact that there was once a dry dock here. There is a lot more background research work for us to do. A main reason for recording these timbers is that in the near future we will not have access to them, because of construction associated with Tideway. We’d assumed that all of Chambers Wharf would be demolished in the building of this, but Eliott was able to fill us in with new details. He showed us where there is a property division part way along the modern wharf, only part of which needs to be removed, so the upstream end of the wharf will be left. Before the tunnel shaft can be built, they have to put a coffer dam into the river, otherwise all the water will flow into the shaft! 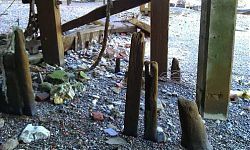 Any archaeology on the foreshore will be recorded, but no excavation of anything unless it would otherwise be destroyed. Then they will take out the piles of the wharf, and cover the surface of the foreshore to protect it. Once the whole project has been completed, the coffer dam will be removed and the foreshore will be left to recover itself! The final icing on the cake, as it were, was that after we’d finished recording the East Lane timbers, we had a bit of time to spare, and some of us wandered along the foreshore up towards St Saviour’s Dock, which we never normally do. And found what we think is sugar refinery waste! This has been one of those things we have heard about, but never believed we’d actually see. It was mentioned in the 1990s Thames Archaeological Survey, it isn’t beautiful but it is reasonably distinctive. 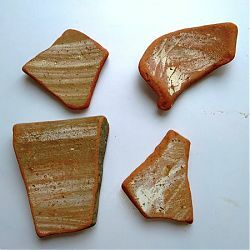 In particular it has a thin coating of light coloured slip on the inside, and potentially either a cone shape or a solid small rim on which the cone would have rested. We need to show our finds to Nathalie sometime, to see if we have found the holy grail of sugar refining!